Words: Ian Vessey's and James Wilden's Report. Stayed at Purn Caravan Park again this year. 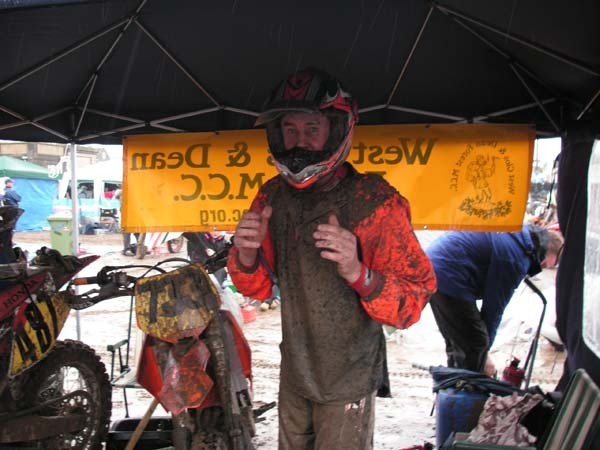 Got a bit soggy on Thursday, but dried up for sign-on and scrutineering on Friday. Not too badly organised this year, just had an hour's wait to get transponders. Went cycling with Roger out to the old fort on Brean Down in the afternoon just for a bit of training before the serious stuff in the Queens in Bleadon in the evening! I had to return home on Saturday to feed chickens etc. so missed the quads and sidecars, but returned to the Queens for more training in the evening. Sunday started out a bit grey, but dry. Unfortunately, we'd seen the forcast so had a good idea what was coming. The rain held off until after we'd set up the West Glos. team pitstop and until we were just leaving the parc ferme. The organisers had gone to great lengths to try to sort out the start. We had to stop behind barriers on the beach, ready to go forward to the start line for a dead-engine start when all riders were out on the beach. Trouble is, no-one where I was in the parc ferme queue could hear the riders briefing, so when the gates were opened on the beach, riders just shot through and off they went! Not so good for the spectators maybe, but better for the riders as when I got to the first few dunes, there was very little queueing so the first lap was fairly quick. 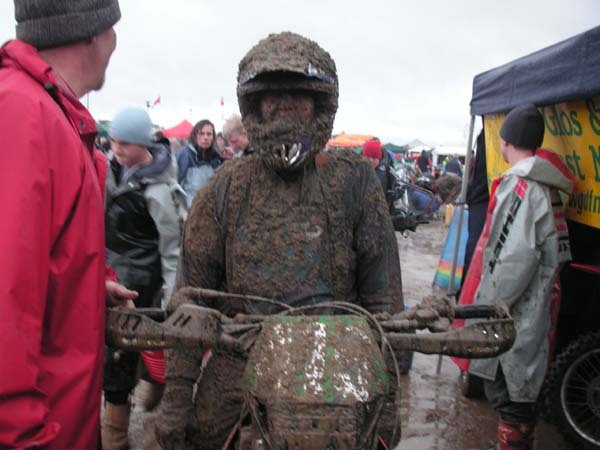 It was certainly a lot wetter this year, with loads of people getting well stuck. This is where it pays to be a steady old codger like me and take your time. I found the best tactic was to follow someone else through the sticky bits - if they got through then follow. 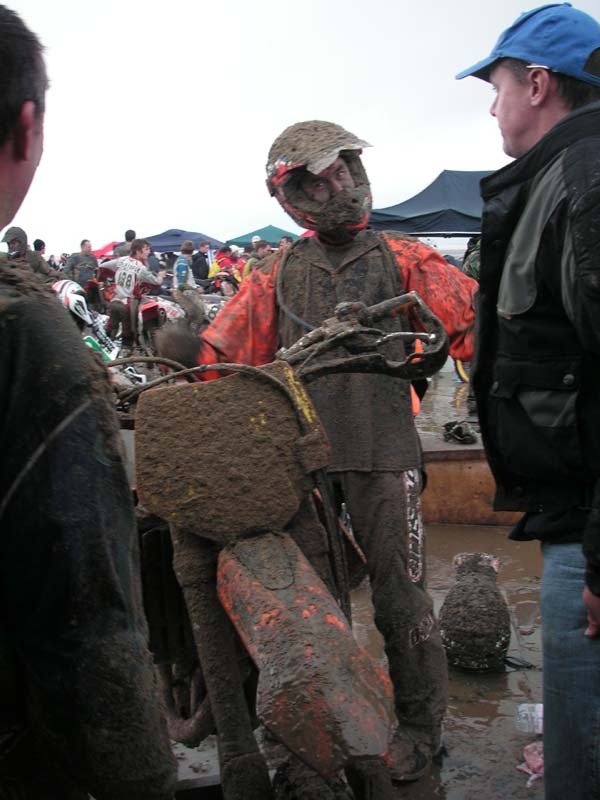 The only time I noticed the rain was when going up the straight where the it would wash the sand off my helmet into my eyes at 60+ MPH (goggles were abandoned halfway round the first lap!). The best way to avoid this was to quickly look up, then duck down for 5-10 seconds and hope nothing got in the way before glancing forward again! I did 3 laps then refuelled, a further 4 and fuelled again. I thought I would have time to do 2 more, but as I came to the end of my 9th lap I found the flag wasn't out yet and I had to do another. The last lap was enough as I was starting to get a bit of cramp, but worth it as I ended up in 234th place with 10 laps - 150 places better than last year - result! This was my first attempt at the beach race and what an eye opener it was. 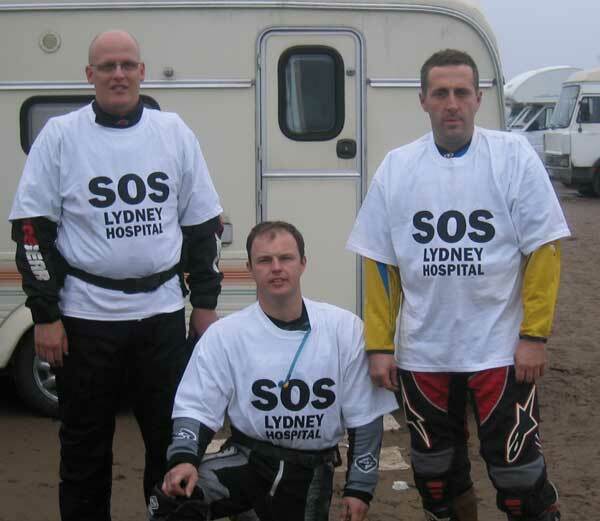 Wayne Hewitt talked Steve Biddle, Martin Kear and I into doing the race in aid of the SOS appeal for Lydney hospital. We were all fine with this, sent in our entries and went about getting sponsors etc (final amount £1,267 now confirmed and cheque handed over. read more...) It only really sank in what we had let ourselves in for at the end of September when we were all talking after Rockfield. Wayne and Steve both converted to 2-strokes especially for the race while Martin and I stayed with our trusty CRF thumpers. We went down to Weston on the Friday lunch time and were pleasantly surprised that we did not have to queue for signing on or scrutineering. By some stroke of luck our race numbers were low enough that we had our transponders fitted for us by the organisers after we left the bikes in Parc Ferme. Due to other commitments we all then came back to the forest. Wayne and two of our Spanner men (Ricki Lane and Martin George) went back down and stayed on the official campsite at the airfield Saturday. They had a restless night with some thoughtful Taffs letting off fireworks at some unearthly hour on the next pitch. Steve and I Left Bream with our third spanner Man, Darren Woodley at 5.30 Sunday morning. We then got the rest of the boys from the campsite, getting revenge on the firework boys with a well timed hoot on the horn. We were among the first in the Pits Sunday morning and proceeded to stake our pitch. While doing this the tide seemed to rush in, filling half the pits and soaking large amounts of peoples kit, quite a sight to see. Gareth Hockey looked worried pacing around. The start was manic to say the least, I did not rush to my bike like most people and got run over by someone on a KX, at least I think that’s what it was. By the time I got to the line all I could see was the spray off the bikes in the distance and had to hurriedly put on my goggles and charge down the straight. When I rounded the first corner I knew that I was in the Beach Race, It was a total stand still with bikes buried in the dune. The good thing about that was that I managed to skirt around the mayhem giving me a clear run at the second, I cleared the dune first attempt. It was on the fifth dune that I became over confident and took off over the top landing on the front wheel, then went cartwheeling down the other side. Luckily no damage or injuries to man or machine so I picked myself up and carried on. 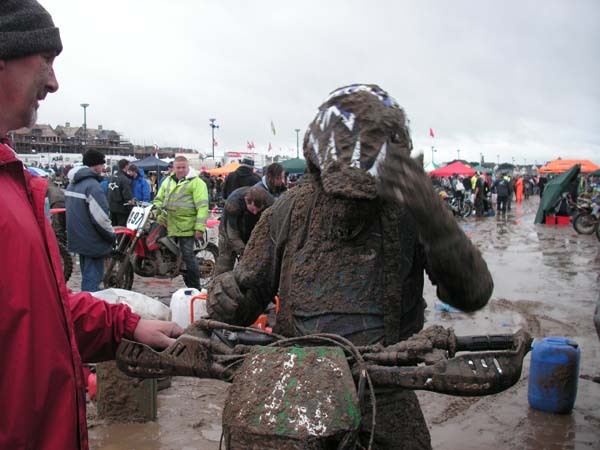 I pitted and changed goggles on the first two laps, then I had to do away with glasses as I couldn’t see a bl#*dy thing. As the race went on the ruts got deeper and deeper and there were bikes stuck all over the place. I managed to keep plodding on but my inexperience showed and my laps were getting slower and slower. By lap 6 I reported to the pit crew that the clutch was slipping a bit, they said there was only 20 minutes to go and that it would be ok for 1 more lap. I got about half way round and it packed in altogether which left me with a long push back to the pits. Wayne only managed 2 laps before his clutch went despite a brave effort from the team completely stripping the clutch trying to repair it. Steve’s bike did not like the damp and kept cutting out in the big puddles. He tried fitting a new plug but that did not work. Despite this he did most laps out of the four of us with 7. 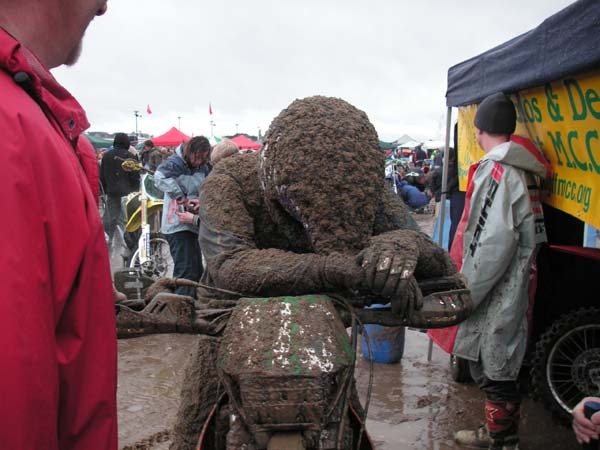 Martin’s day started badly when he found that the petrol cap had been stolen off his bike in the Parc Ferme. The organisers gave him a new one but he did not know how much water had got into the tank from the night before. He finished with 6 laps in the end but when he got into the pits he discovered half the engine casing worn away by the chain, the chain guard had gone? 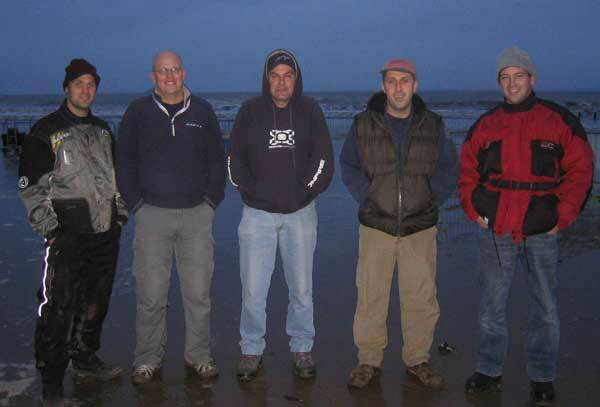 I think we all enjoyed our day out on the beach and agree that it is an experience all Bikers should try at least once.